When I first saw the price I was worried something was wrong! Why are the so much cheaper here then in stores? So I took the plunge and purchased! Super happy I did! Great PRADA shades for such a great deal! They fit perfectly anf look amazing! Complete your smart and sophisticated look with these rectangle glasses from Prada. Featuring a sturdy metal frame, this eyewear comes in a gunmetal color that will pair well with any ensemble. Optical frames are sold with demo lenses. See your optometrist to have your prescription filled. 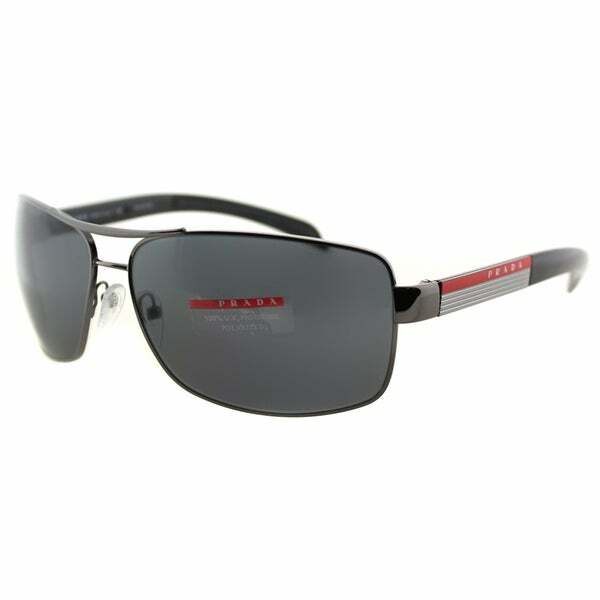 Pradas linea rossa mens sunglasses are the absolute perfect fit and are incredibly comfortable and attractive. This is probably my 3rd pair and hopefully I will not lose these again but if I did I would buy them again for sure. I would absolutely recommend these to anyone looking for a fashionable and stylish comfortable pair of polarized sunglasses. I love these prada, Ive them in 3 different colors. I love Prada Linea Rossa Men's Sunglasses ...So i'm happy when i found it i was purchased from Overstock.com ,the price so good and this item very nice and manly....! I absolutely recommence it ! Excellent glasses! Very good quality and they fit perfectly! Very happy with this purchase. Bought them for my son and he loves them! I think this product is very comfortable ,stylist, perfect for anti sunshine and the price so great ...! Styles Manly, the price so good. "Does these pair of sunglasses come with a Prada Case"